4/8/08 — Robbery — Odessa (Ukraine), Museum of Art — A few years ago, the reappearance of The Taking of Christ by Caravaggio, identified in a Dublin convent, had caused quite a sensation . Anyone who has seen this sublime work which today is on long term deposit at the National Gallery of Ireland cannot help but be convinced of its authenticity. 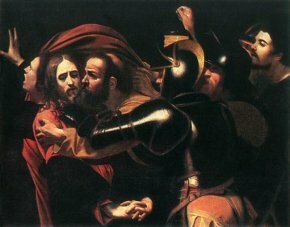 Among the other known versions, the one in Ukraine, at the Odessa museum (ill.) is considered to be a good copy, at times even having been seen as a replica painted by Caravaggio himself. This painting has just been stolen from the museum after being cut away from its frame. Its disappearance, revealed only on Saturday, is without a doubt a serious loss to Ukraine’s heritage. Nonetheless, its sudden transformation by the media following the robbery into an undisputed work is rather remarkable and simply a reflection of their incessant search for the sensational . The same phenomenon occurred after the theft of the Duke de Buccleuch’s Madonna, which had dubiously been attributed to Leonardo da Vinci. Whoever the robbers are, they now find themselves with an unsalable work on their hands as it is too well known and bears a questionable attribution. The story of this rediscovery is told in a fictionalized but solidly documented and truly fascinating manner by Jonathan Harr in his book, The Lost Painting, published in 2005.